How Much Wedding Photography Coverage do I Need? This is a question I get asked quite often, and I am more than happy to discuss it with you individually through email, over the phone, or an in-person consultation. But here's some basic essential information that can help you make this decision. Compared to some other parts of the country, weddings in New Orleans and the surrounding Gulf Coast region tend to be more “compact” in terms of the timeline. Rather than a five-six hour reception (including a cocktail hour and a formal seated dinner), receptions here are usually three hours (sometimes four hours, but rarely longer), and more often have a buffet-style meal rather than a seated dinner. So, this means four to six hours of photography coverage is usually sufficient to capture the entire event. The main factors influencing how many hours of coverage you need are how much (if any) “getting ready” coverage you want, how long the ceremony and reception are, and if multiple locations are involved. For a courtyard wedding in the French Quarter with a brief ceremony and the reception at the same location (or within a short walking distance), four or five hours is sufficient, while if you are having a full Catholic mass (with a reception at a different location), five hours would likely be the minimum you’d need, with six or seven, maybe even eight hours being more comfortable. Another factor is whether or not you are having a first look. With a first look, you usually will need an additional hour or two of coverage more than you otherwise would, since we’d likely be starting a little earlier and would be doing most or all of the formal group shots before the ceremony (instead of cutting into the cocktail hour or reception time). So even though you do need more photography time, you get the benefit of being able to enjoy more of your reception. If you strictly want ceremony and reception coverage for your wedding, determining how much time you need is simple, as you’d just schedule your photography to begin at the start time of the ceremony (or perhaps 30 minutes before), and conclude at the end of the reception. And just to note, if your ceremony begins at, say, 6:00 and you book me to start at that time, that doesn't mean I'll be walking through the door right at 6:00. I will get there well before then to get set up and be ready to begin shooting when the coverage is scheduled to begin. If you want to have some getting ready coverage, and/or want to do a first look, the simplest way to figure out how much time you should book is to look at the end time of the reception, and count backwards the number of hours in the photography package you are considering, which would give your hypothetical coverage start time. Assuming prep, ceremony, and reception are all at the same location or within a short walk (so no transportation is needed), you’ll want to start about one to two hours before the ceremony if you want getting ready coverage or are having a first look (with minimal or no getting ready coverage), or two to three hours before the ceremony if you want getting ready coverage and are having a first look. If there will be travel between the prep, ceremony, and reception locations, be sure to factor in appropriate time for this. Estimate on the high side, as it almost always takes significantly longer than expected to transport groups of people on a wedding day. Should I Have my Photographer Stay to the End of the Reception? While in some parts of the country it’s fairly common for the photographer to leave before the end of the reception, down here this is the exception rather than the rule, as in most cases the photographer is present for the entire duration. 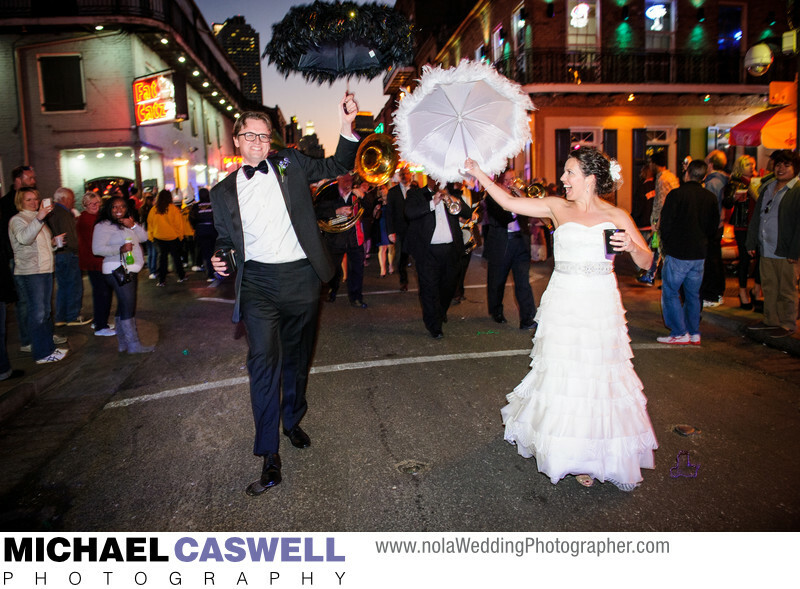 New Orleans weddings in the French Quarter and sometimes even in other parts of the city often conclude with a festive second line parade through the streets, led by a brass band, and you certainly will want coverage of this! Even if you are not having a parade through the streets, most weddings in this area will at a minimum have a second line dance through the reception venue as one of the last songs of the night, or you might be having a grand send-off from the reception venue, such as with your guests blowing bubbles, throwing birdseed or flower petals, or holding sparklers, which are certainly worth capturing. And, some of the best reception photographs can be had late in the event on the dance floor after everyone has loosened up. However, it’s certainly not unheard of nor a problem to end the coverage midway through the reception if you prefer. If that is the case, just be sure to let your wedding planner and/or the venue coordinator know, so that they can ensure that any significant traditional elements (cake cutting, bouquet/garter toss, etc.) are scheduled to occur before I depart. And again, if you would like to have a personal discussion about the particulars of your event's timing, please don't hesitate to call or email me. While a professional wedding coordinator is worth their weight in gold in terms of planning the flow of the day and ensuring everything goes smoothly, I'm happy to also discuss this with my couples.